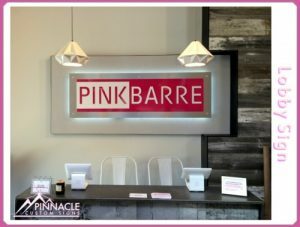 What you should consider when purchasing a lobby sign. The first impression that clients have when entering your business can never be redone and is critically important to the business relationship. Choosing the right lobby signs are key in helping to control that first impression. This form of signage often conveys your brand to the client before they are greeted by the front host. It’s important to make sure that your entry signage represents the message you want your clients to receive when they first enter the door. 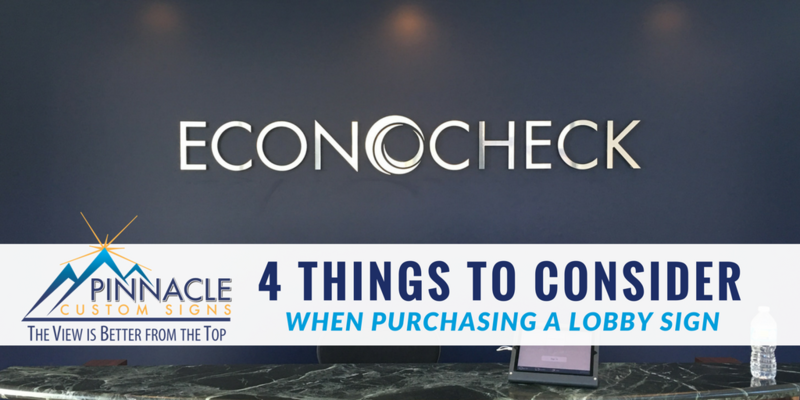 To help you, we have put together four questions you should ask about your new or existing lobby signage. 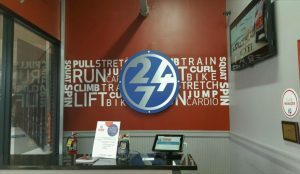 What form of signage emphasizes your logo? Lobby signs tend to be the first representation of your logo or company name. Often, a business logo was originally created to be a flat image for business cards or your business website. Transitioning that logo from 2D to 3D can often convey more about the personality of your company. That transition can create more dimensional variations of your logo than you might think. The nature of your business will also impact your interior signage. An accounting firm may have a more structured and professional sign than that of a daycare facility. The style of your signage often comes from the characteristics of your business. Color, materials, and finishes are all ways to convey those characteristics and create more than just a logo on your signage. What adjectives come to mind when you think of your business? Reserved? Tactful? Spontaneous? Prompt? If you have a business that is laid back with a fun environment, you might consider round edges and bright colors. A conservative business with strict codes and guidelines may want to consider straight lines with traditional fonts and colors that convey integrity such as purple and gold. Are you giving personal greeting to customers, clients, or potential new employees? Who is your target audience? What do they expect? Consider your target audience and you will be well on your way to answering the first question of lobby signs. 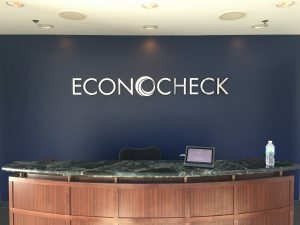 With all the possibilities for lobby signage, there are options for any budget. A metal sign could use solid metal or could use non-metal letters that have a metallic finish so that they appear to be metal. Creating lighted signage will be more expensive than creating signs that have a reflective coating but no lights. And simply creating vinyl graphics can be more cost effective than dimensional letters. Speak with your sign company about the options that fall within your budget; they can provide you with a number of options that fall within your range. Many sign companies, like Pinnacle, have show rooms that will provide you with samples of various designs to give you ideas. What Is Your Lobby Space Like? Most of the time, an onsite visit will take place prior to creating a lobby sign so that exact size and knowledge of items needed for installing the sign are known ahead of time. Pinnacle often comes out to advise business owners on the best sign size and location for your space. We can discuss your ideas and give you the best solution for that space with materials that will convey the message you are hoping to achieve. Considering the viewing angles, distance, and type of wall will have a bearing on the installation process for your signage. Do you have the necessary background for the mounting of the sign? If you hope to have illuminated signage, then considering the location of or the installation of power sources will be required. These factors play a role in the impact your signs have on people walking through the door. If there are future plans to relocate your business, then you should consider signage that can move with your business. Certain types of signs are easier to relocate than others. Panel signs are the easiest to move from one location to another. Panel signs are often mounted with brackets that can be removed and then reinstalled in new places. Individual letters mounted to walls can also be reinstalled but will require minor repair of both the wall and the letters. 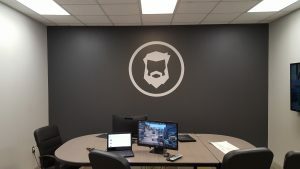 However, things such as vinyl wall graphics are typically permanent and will have to be replaced. Pinnacle’s team has the experience of designing and installing many lobby signs over the years. We can help you with finding the best angle, size, and design to maximize your lobby sign in your budget to make the right impact on your guests. Contact us for a complimentary consultation and let us schedule an on-site visit to assist you with your lobby sign needs.